Bullet Lines Underwater Boat Lights are the best in the industry in quality and value. These underwater boat lights were designed with one thing in mind: provide the most LED lumens per dollar without sacrificing quality. Our X8000 underwater boat light produces 750 lumens while only pulling a little over an amp of power; cost of this underwater boat light is less than $350.00. Our X6000 underwater boat light has tremendous value producing 360 Lumens, and the cost is less than $170.00. Both of our underwater boat lights can be installed in less than 1 hour; they are surfaced mount, and only require one small hole thru the hull to complete installation. 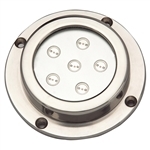 If you want quality and value in underwater boat lights, then Bullet Lines is your only choice. Sale Price: $398.97 Lowest Price Guaranteed! Light up the water with Bullet Lines custom surface mount under water transom LEDs. These small LEDs will light up to 30' of water behind your boat..